Brighter Backup. These replacement LED bulbs are a great way to improve the look and function of the reverse light on your Kia Forte. You will get higher visibility at night, with a modern look. The installation is straightforward, with just a bulb swap - making this one of the easiest ways to improve the Forte's lighting. Reliability. 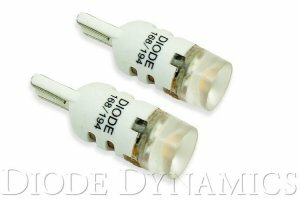 Unlike other bulbs on the market, Diode Dynamics LEDs are built with constant-current inductive circuitry, along with transient suppression. While more expensive than simple bulbs, this allows Diode Dynamics LEDs to last for years, with no flickering or failure. Experience. After over a decade in business, Diode Dynamics is the most trusted name in automotive LED lighting. Unlike other suppliers, we do not simply re-brand generic products. We directly manufacture and engineer LED lighting in the United States, allowing for higher quality, with the newest and brightest LED technology. We then test and install them in our garage to make sure everything works correctly. Whether it's a Kia or anything else, we pride ourselves in offering only the best possible LED solutions. Please contact us if you'd like to discuss your lighting project!